All parts of Woman's Weekly magazine's exclusive free granny square pattern for The Portuguese Tile Blanket are now available! 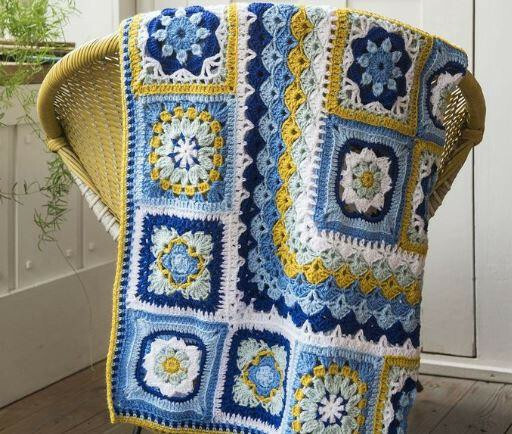 Inspired by the ceramic tiles of sunny Portugal, this beautiful design is made up of a series of gorgeous crochet granny squares, joined together with shell stitch between, holding the design together with a simple border. You can purchase our exclusive yarn pack for only £9.99, which includes all the yarn you will need for the whole blanket. The pack contains 6 x 100g balls of Stylecraft Special DK yarn in shades of gold and azure. The blanket measures 104 x 104cm/41 x 41in. when complete. This is an intermediate pattern and would make a lovely addition to any home. Contrasting colours make The Portuguese Tile Blanket an eye catching and fun design. As you progress with each instalment, the blanket will slowly come together to create a masterpiece that we are sure you will treasure and enjoy for years to come. Join our Facebook CAL group here to share your progress and pick up hints and tips as you make your blanket.